How to build guards has never been provided for in the code, and even the loads that guards must resist have been pretty fuzzy throughout code history. Those target loads have come into some pretty serious question now that so much testing is being conducted to assure guard posts will meet a 500 lb or greater load. The current code requires the top of a guard and handrail to resist a 200 lb. load in any direction. Any direction means upward and inward, two directions that have nothing to do with a guard’s purpose, fall protection from an elevated surface. They do relate to a handrail’s purpose, to brace a fall in any direction and to assist in ascending or descending stairs or ramps. The ASTM testing standards for composite rails and the ICC Evaluation Services acceptance criteria for other manufactured guards don’t exactly match the code, and the loads are questioned in all. This problem is well understood, yet meanwhile, proponents have been only narrowly defeated in the last two code modification cycles in their attempts to have prescriptive ands specific guard post connection details included in the IRC. It is the opinion of many others that the target loading and the direction of loading needs to be reevaluated and set more appropriately, before methods to meet the loads are solidified in code. That was the reason I, taking NADRA’s voice, attended the American Society of Civil Engineer’s (ASCE) Live and Dead Load Subcommittee meeting on November 7th, 2018. The ASCE 7 standard is the nation’s go-to for establishing the minimum design loads for structures of all sorts. It’s generally the basis for the loads in the I-codes. So rather than attempt this change for guard loading at the ICC level, we went one level further in. The ASCE meeting was to review proposals and ideas for the next 2022 version of the ASCE 7 and proposals they are planning for the 2021 IBC development next year. The National Home Builders’ Association (NAHB), a friend to NADRA, led the charge with public comment proposals to the ASCE committee requesting guards and handrails be separated and their minimum loads and load directions be individually determined. While a handrail does need to resist a load in any direction, a guard does not. I spoke at the meeting in favor of the NAHB public comment and provided history of guard and handrails loads going back to the 1970. Over those years, guard and handrail minimum design loads were quite varied. On the west coast, under the Uniform Building Code, only a 20 lb. horizontal load applied 90 degrees to the guard, but on the east coast, under the Standard Building Code, it was 200 lb. in any direction. From the 70’s to 2000 IRC, guards underwent a lot of changes regarding design load, but still at that time guards weren’t tested by any more than a push from the inspector. Guards and handrail loads were combined, then separated, but then in later years combined again. The history and the companion testimony at the meeting helped show the ASCE committee that indeed today’s design loads in the code and the ASCE standard are due for reevaluation. Before building the house of new deck codes, let’s make sure we have a good foundation. Alongside NADRA and the NAHB, the Stair Manufacturers’ Association and the Composite Lumber Manufacturers’ Association also provided insight into this much-needed reevaluation. The ASCE Committee agreed and affirmed a motion to work with the NAHB further on this issue. This was a great step in the right direction. Though we attended the meeting for the guard discussion, there was more to learn. Code and standard proposals and recommendations can come from anyone. Being present and available to learn of those other proposals and to quickly respond is a very important part of representing an industry in code. Another public comment was also presented, one that could have a major impact on decking. Stair treads are required to resist the familiar 40 psf live load that a deck surface must resist, but they also must resist a concentrated load of 300 lb. over a 4-square-inch area. This has to do with the impact from the balls of your feet while rapidly descending stairs. It has been in the codes for all stair treads since 1979. You may be familiar with composite decking stair tread span limitations. Due to this additional concentrated load, most composite decking has reduced allowable spans when used as stair treads. 16-inch on center joists for the deck, often have to be reduced to 12 inch or less on the stairs. A surprise proposal we were not expecting was to require the same stair tread concentrated load throughout the deck. Changing the minimum loading requirements, means re-proving that decking can meet the new loads, including the lumber decking spans brought into the code in 2015. If these changes were made, they would need to be with good justification and industry-wide evaluation. The proponent argument for this proposal was in response to impact from stepping off ladders and known cases of deck board failure. What wasn’t shared is how many instances? How old was the decking? What was the condition? These were all questions posed by others in the room, as it is becoming well known that well-intended reactions to anecdotal instances have shaped a lot of recent codes. The very quick question I, we, NADRA, asked was why decks are being singled out and not all floor systems? If this is a human impact load on a floor surface, then what distinguishes the hazard between the floor inside the house and the deck? Why would the decking industry be singled out? Do we not use ladders inside the home? There was no solid answer to these questions and an affirmative motion to shelf the proposal and request more information and reason statements from the proponent. Our efforts at this meeting have helped already to steer the future, but the winds are strong and the journey long. We need your support to stay involved in this critical work. When: Wednesday, October 5th from 8am – 12pm. Presenter: Jim Mailey. 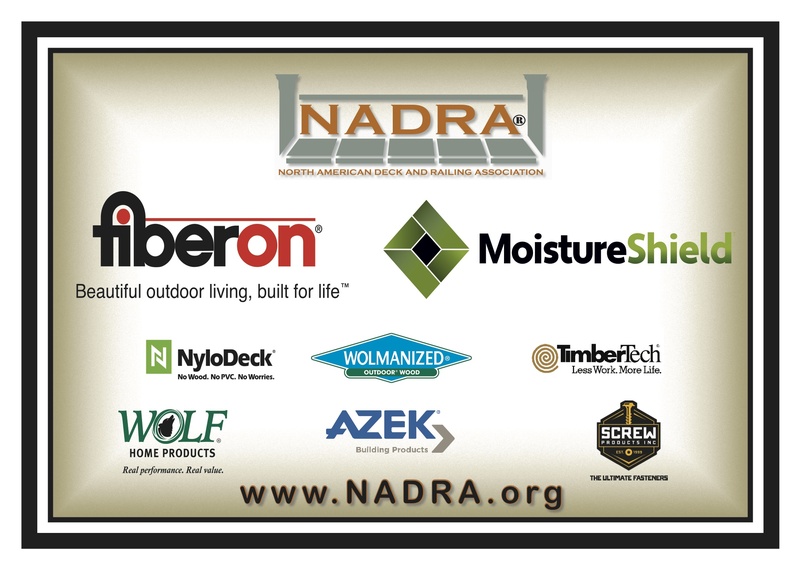 This four-hour session will teach the home inspector how to safely inspect a deck using the NADRA Deck Evaluation checklist. This checklist has been developed specifically for home inspectors as a comprehensive tool to be used to properly assess the safety of a deck. At the conclusion of this session, the home inspector will understand how to analyze the following deck components and issues: stairs, footings and posts, joists, joist connections, girders, ledger connections, deck boards, handrail assemblies and guards, recognize proper and improper fasteners, assess hardware or material corrosion, and review the safety standards of all (decks, stairs, guards) structures. When: Wednesday, October 5th from 1pm – 5pm. Presenter: Glenn Mathewson. Now updated with all the new 2015 IRC provisions, this course completes the load path started in course 2, Ledgers and Lateral Loads. Decking, joists, beams, posts, foundations and even properties of the earth are covered, so that the entire structural system and related codes can be understood. This course also covers the topics in the NADRA Master Deck Professional-Codes 2015 certification renewal! Understand the basics of proper deck foundation design and construction. Comprehend the concept of a load path and how forces are transferred through a structure. Learn of various standards and sources for validating a deck’s structural system, but without an engineer. Registration: You can register right here on NADRA’s online event registration portal. Why doesn’t every deck builder belong to NADRA? What can we do to spread the word about the benefits of belonging to trade organizations? I see some NADRA chapters that have become relevant, educational, generous groups of builders. They are doing great things in their communities and sharing experiences, knowledge, and their time with each other. These are the groups that are making an impact in our industry. How can we get more chapters started and reinvigorate chapters that have not gotten off the ground? In this latest FastenMaster Blog post I look at some of the benefits of trade organizations. Who wants to help get more chapters going? As a sales person working for a manufacturer, I know that by joining an association of builders I have the opportunity to connect with the people that use the products I sell. For me the value I receive is far greater than the annual fee I pay. For builders the value can be even greater. Financially it is in your best interest to belong to the trade associations representing your business. These organizations are made up of members at the core of your business and can bring you many benefits. Benefits may include advice on building issues and code compliance, or advice on legal issues concerning your customers, your business and your employees. The availability of this advice alone can outweigh the cost of membership if you avoid one costly legal issue. Your annual membership is probably going to be less than 1 or 2 hours of legal fees. Associations give you a voice. I’m sure you can think of plenty of things having an impact on your business that you wish could be changed. It may be local, state or national regulations. It may be availability of materials or the quality of the materials. Alone it is hard to get anyone to listen or to appreciate the issues you are having. Get together with a group in your same industry and you will be heard by manufacturers and suppliers, you will even start to make gains with the building officials. Hearing from a group gives the authorities confidence that they are hearing about issues affecting an entire sector of an industry. As your trade group grows so does your voice. Belonging to a trade group can even improve your image by increasing your professional credibility. For many industries membership in the trade association can be a mark of quality and shows the public you are part of a respected group of builders. This is especially true when the association works hard promoting community involvement projects. I am sure you are aware of groups that have done remodeling work for families suffering through hardships, home repairs for victims of tornados or hurricanes, decks built for veterans, and even homes built and given to deserving families. Not only is the recognition of being associated with these projects valuable. You will also enjoy volunteering yourself and your resources for these extremely meaningful projects. Educational opportunities are a benefit realized at nearly all trade associations. Members are offered continuing education opportunities, certification programs, and discounts with online education and local colleges. Regular chapter meetings will often times include presentations by experts in materials, software, marketing, and other aspects of your business. Any of the above benefits are of greater value that the annual dues you pay. Business Resources such as easy access to forms and templates exclusive to your industry. Public Relations: Most groups are doing marketing for their members. Brochures and mailers, “How to Select a Builder” or “Deck Safety Month” flyers. Connect to customers through websites and trade shows. A Higher Level of Accountability: The unlicensed handyman, the Chucks with Trucks, the lower quality builders are not part of these groups. Trade Show Attendance: You will have free or discounted access to attend many shows. NAHB claims that members saved more than $1 million in admission fees at the International Builders Show last year. Trade Show Exhibiting: Many associations sponsor shows for homeowners giving you a great venue to attract new customers. Insurance Group Savings: Insurance plans and prescription drug plans can represent huge savings compared to any plan an individual could get. Networking with Your Peers: A non-competitive environment to talk with and learn from others that are in your business. Make More Money: Members of trade organizations make more than their non-member competitors. The knowledge, resources, and expertise gained are realized in greater revenues. Weekly newsletters with the latest news in your industry. Trade associations are critical to improving the industry you make a living in. Not only do associations help you become more successful, they give your industry a voice and can quickly communicate to everyone in the industry how government regulations will affect members. Below is the reply I got from Lainie Sleppin. When I asked her about the benefits of being a NADRA member. Glenn Mathewson is extremely active in the decking industry and has been involved at nearly every level of the industry. From laborer to carpenter apprentice to business owners and as a building inspector in Colorado. He is an expert in our industry. Below is his reply when asked about the value he sees in trade associations. What is your experience? Do you belong to a trade association? Let me know what ones you belong to and what you see as the benefits to your business.